Just typing that subject line makes me snicker, thinking how ticked Vlad would be if he could see it. His feelings aside, I have good news for you, readers! INTO THE FIRE, the fourth and final Night Prince novel featuring Vlad and Leila, is only sale for only $1.99 in ebook. This is a flash sale, so it ends on April 8th. Sale guaranteed for US residents only. Haven’t met the Night Prince (a.k.a Vlad, a.k.a. don’t-you-dare-call-him Dracula) yet? More good news, then! Book one, ONCE BURNED, is only $2.99 in ebook. Vlad Tepesh inspired the greatest vampire legend of all—but whatever you do, don’t call him Dracula. 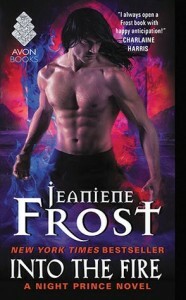 Vlad’s ability to control fire makes him one of the most feared vampires in existence, but his enemies have found a new weapon against him – a beautiful mortal with powers to match his own.